Escrito el 22nd Febrero 2017. TVCortos once again went to the Cannes Film Festival to host another exciting edition of The Pitch! The competition gives filmmakers the opportunity to pitch their next short film idea to our expert jury panel for the chance of winning 5000 Euros production funding and broadcast of the finished film on TVCortos. Twenty filmmakers from around the world were invited to pitch their idea to us at the Short Film Corner. They each had one minute to pitch to our cameras, which our jury then watched along with their show reels of past work to decide who should progress to the live final at the UK Pavilion. Four of our five finalists hailed from the UK – Daphne Schmon & Emily Carlton, Glyn Carter, Kyla Simone Bruce and Jessica Benhamou & Adam Smith. Our fifth finalist came from India in the form of well-known actors Manish Raisinghani & Avika Gor. Our expert jury panel consisted of TVCortos CEO, Carter Pilcher, Icelandic filmmaker and previous pitch winner, Anna Olafsdottir, and Netherlands Film Festival Programmer, Vanja Kaludjeric. They had a tough job as our finalists all delivered strong pitches and show reels while also managing to answer the jury’s gruelling questions. But in the end, the jury was won over by Kyla Simone Bruce, who had a creative and hilarious pitch for her short film idea, ‘Mercury’ and an impressive CV of past work. 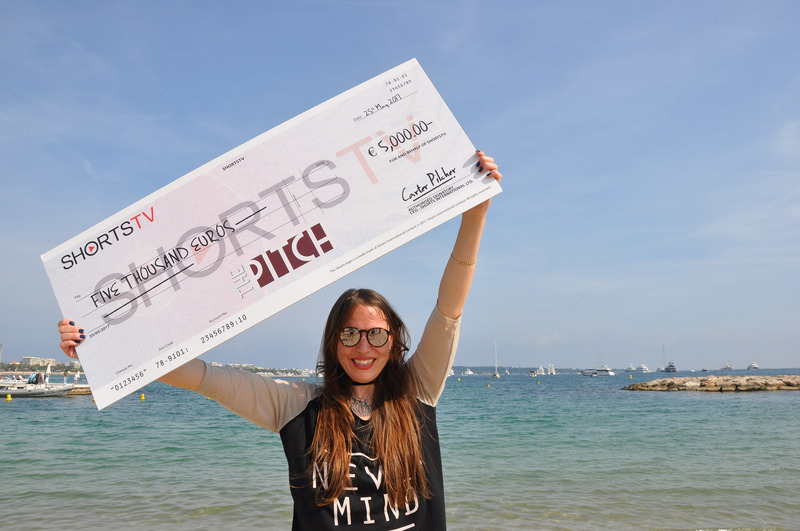 Kyla walked away with 5000 Euros from TVCortos to bring her short film idea to life. The finished film will premier on TVCortos around the world so stay tuned to the channel to see it!